Due to the presence of the three highly potent fruits, it has a rejuvenating effect for balancing of all three doshas – Haritaki for vata, Amalaki for pitta and Bibhitaki for kapha. 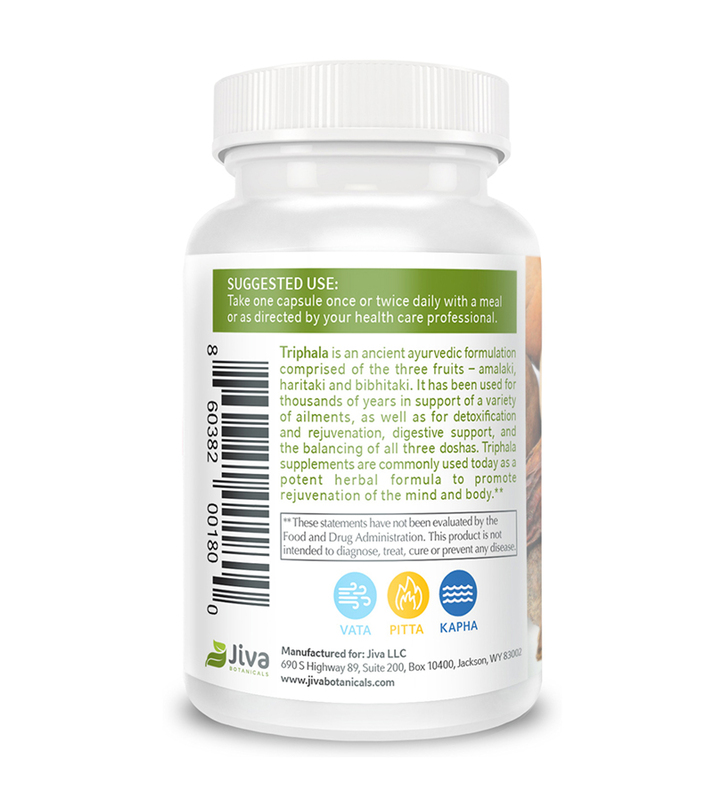 digestive support, and the balancing of all three doshas.Triphala supplements are commonly used today as a potent herbalal formula to promote internal and external rejuvenation of the mind and body. A powerful tridoshic rasayana (life extending/enhancing formula), Triphala is an important poly_herbal formulation in traditional Indian medicine. Triphala loosely translates to the three fruits [Tri= three and phala= fruits] due to the fact that it is composed of equal portions of the myrobalan plums Amalaki, Haritaki, and Bibhitaki. As a supplement, Triphala is considered a potent Ayurvedic medication possessing high nutritional content. The capsules are rich in antioxidants, polyphenols, flavonoids, Vitamin C, gallic acid, malic acid, ellagic acid, tannins, lignans, and phyllembelic actic. This item is cruelty-free and contains no animal products. It is safe for consumption for vegetarians and vegans. Please consult with your healthcare practitioner prior to the use of this product. Keep out of reach of children. Triphala supplements are readily available and consumed in different forms including powder, capsule or liquid. Triphala can also be used as a hair wash, wound cleanser, eye drop, skin massage oil, and mouthwash. Generally considered safe for consumption as an Ayurvedic medicinal herb for the treatment of a large range of ailments, a Triphala supplement may be taken daily for the restoration of health, and the cleansing, detoxification, and purification of the entire body. 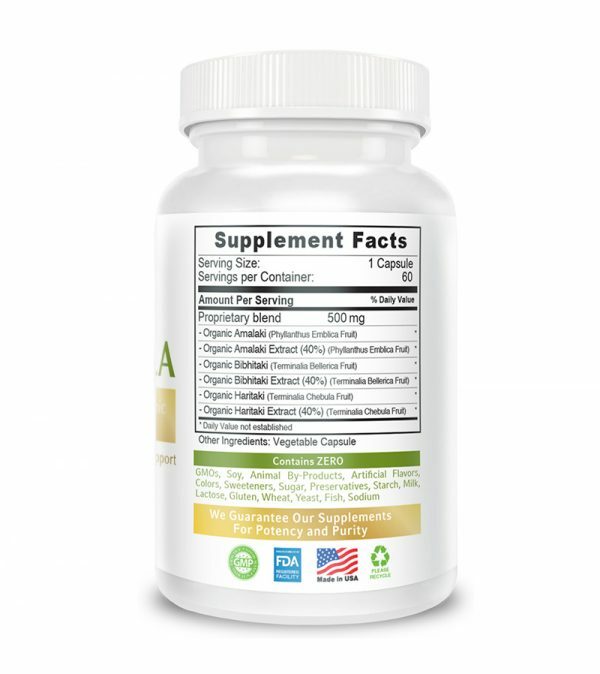 Though generally regarded as a safe nutritional supplement with a number of potential health and nutritional benefits, Triphala is a naturally detoxifying or purifying formula used to purge the unhealthy toxins from the body. As such, it should only be consumed in the recommended safe dosages. Irrespective of that, some people may be prone to experiencing some unpleasant effects following its intake. At present, no current studies support or guarantee Triphala’s safety for pregnant or lactating women, and its use is best considered contraindicated. It is also not recommended for use by young children. As a natural laxative, Triphala is contraindicated for use in people suffering from diarrhea, or dysentery. It is also not recommended for use in people with bleeding disorders. 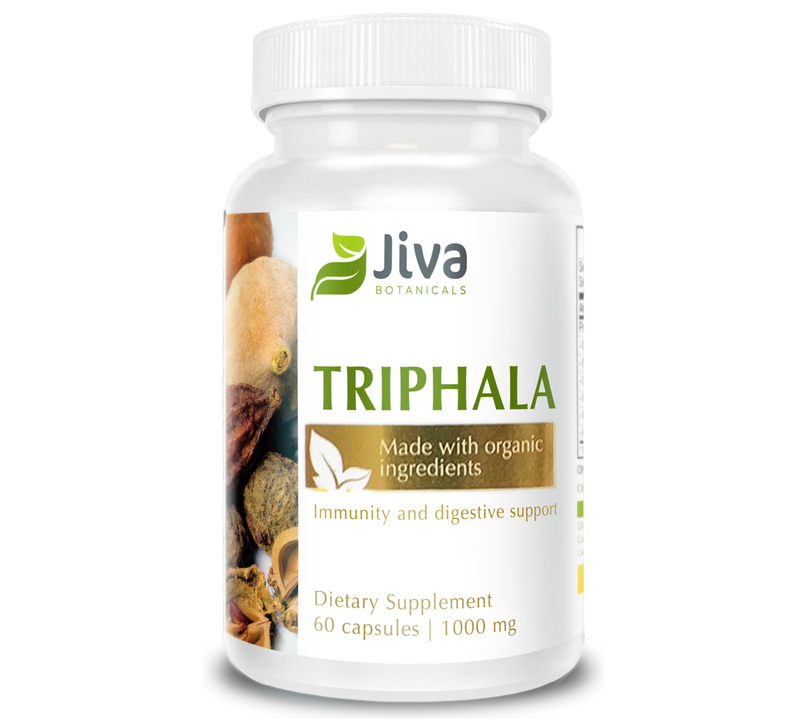 Some studies indicate Triphala affecting the normal platelet function. Therefore, it is not recommended for use for people who take blood-thinning drugs such as Warfarin. How to take Triphala supplement? Triphala supplements are available as tablets or capsules, as well as in powder and liquid forms. Advice on how to consume the supplement varies depending on the condition to be treated as well as the supplement consumed. Typically, it may be taken with warm water in a tablet or capsule form. The powdered version may be mixed with ghee (clarified butter), warm water, or honey. As a general supplement, a regular dose of 250-500 mg per day is recommended. However, the safe Triphala dosage may range from 500 mg to 1 gram per day. Are there any side effects of taking a Triphala supplement? Triphala side effects such as diarrhea or stomach cramps are usually only apparent at higher doses. However, some users have reported feeling nauseous when taking this herb. Triphala, due to its potent laxative properties, is also contraindicated for use in pregnant or lactating mothers. It is recommended that you speak to your health practitioner before taking any supplements. As part of Ayurveda, it has successfully been used for the treatment of a number of serious ailments for centuries. 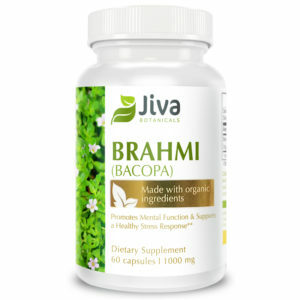 Its effectiveness has long since been studied and recorded through positive Triphala reviews. 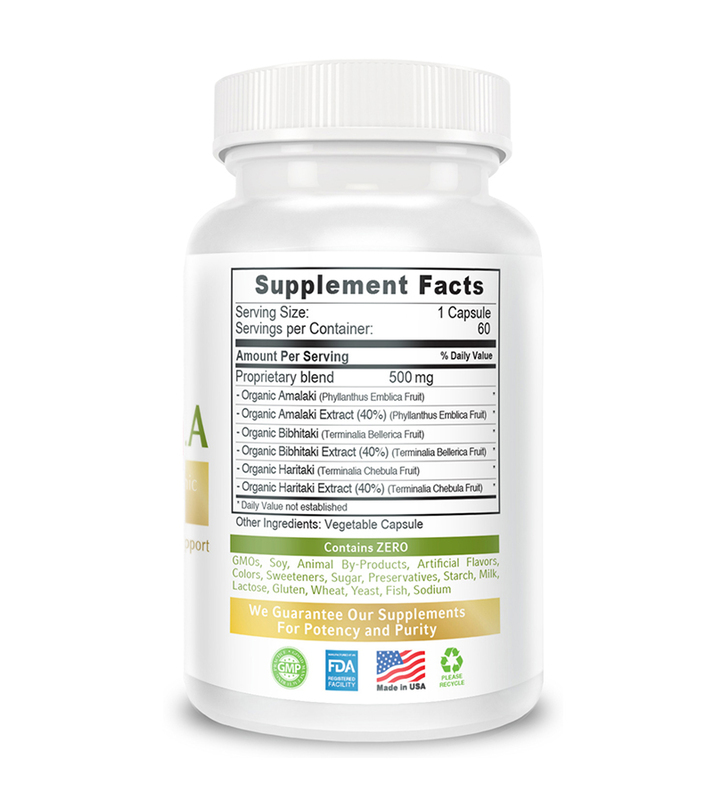 As each individual is unique and responds differently to this supplement, results varying. Depending on the frequency of use and dosage, you can generally expect to see positive results and changes within a couple of weeks, at most. As a general guideline, it is recommended that you consistently use the supplement for a minimum of 6 weeks for optimum results. Can Triphala be taken in conjunction with other herbs? Medicinal herbs are often known to work synergistically with other herbs, i.e., they may be able to complement and enhance each other’s effects. While Ayurvedic medicinal herbs and formulations have been used safely for thousands of years, it is recommended that you consult with your health practitioner before using Triphala in conjunction with any other herb or medicine. 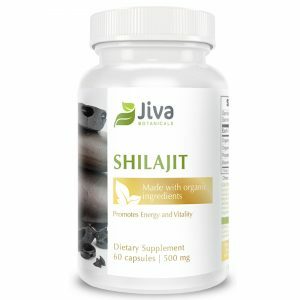 What is the best time of the day to take a Triphala supplement? The best time and way to take the supplement depends on the form in which you take it and your reasons for taking it. For detoxification and cleansing purposes, it’s best to take Triphala capsules at night. Its laxative effects help regulate the microbiome in the digestive tract and regulate the mucous quality in the respiratory tract. When taken in the morning, Triphala helps regulate blood sugar levels and eliminates unwanted fat cells, promoting weight loss. It’s recommended to take the supplement first thing in the morning – before breakfast. It may also be taken with meals to enhance and support the digestive process.